A one-woman performance of song, poetry, and spoken word, the One Voice Project is a response to the question: What can one person, one body, one voice, express, through sound, movement, music, poetry, silence? Performed live and unaccompanied by singer, composer, and actress Lisa Neher in beautiful and unusual spaces, the One Voice Project connects the worlds of music, theatre, and the written word. Featuring six brand-new musical works by composers from the U.S. and abroad and poetry by local and national authors, the One Voice Project offers audiences a unique, intimate, cross-genre performance experience. "the hour you can’t purge"
"through the glass Alice touches her hair"
"lamplight as night drains into day"
Follow the One Voice Project! The call for submissions is now closed. Thank you to everyone who submitted! The goal of the One Voice Project Call for Scores is to expand the repertoire for unaccompanied voice. While there is a strong tradition of solo instrumental works in the classical repertoire, there are relatively few works for solo voice and classical singers rarely perform as true soloists. 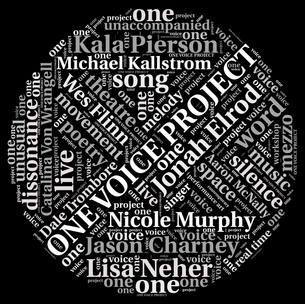 By partnering with living composers, the One Voice Project will promote unaccompanied vocal performance as a genre and promote the creation of new works for singers. The call for scores is now closed. Thank you to everyone who submitted!